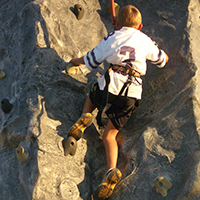 Local climbers enjoy the new climbing wall at the KSU Recreation Complex, as well as trips to Colorado and Missouri for climbing adventures. We have increased the variety of climbing gear we carry in recent years, in order to assist climbers with their varied needs. Our most popular climbing items are chalk bags and chalk balls, perfect for the climbing wall, and we also offer a wide variety of carabiners and several styles of harnesses, as well as basic climbing shoes and a few ropes. Don’t see what you need? Ask us – we may be able to order it for you.